Plasma explosions from the sun over billions of years have all but stripped Mars of its atmosphere. But a new discovery by NASA shows that remnants of the Red Planet’s magnetic field can be found in the form of a rotating ‘tail’. Invisible to the naked eye, the so-called ‘magnetotail’ was recently detected by NASA’s Mars Atmosphere and Volatile Evolution Mission spacecraft (MAVEN). MAVEN was launched in 2013 to trace the Martian world’s climate history and determine if it may have once sustained life. The ‘tail’ phenomenon is caused by solar winds whipping over the surface of the planet, resulting in the remaining pockets of Mars’ once-protective magnetic field joining with sun plasma particles. The process can cause magnetic forces to be twisted by the 1.6 million kph solar winds, said Gina DiBraccio, of NASA’s Goddard Space Flight Center. It may also be contributing to the destruction of Mars’ thin atmosphere, allowing gases to escape into space. “We found that Mars’ magnetic tail, or magnetotail, is unique in the solar system,” DiBraccio said. 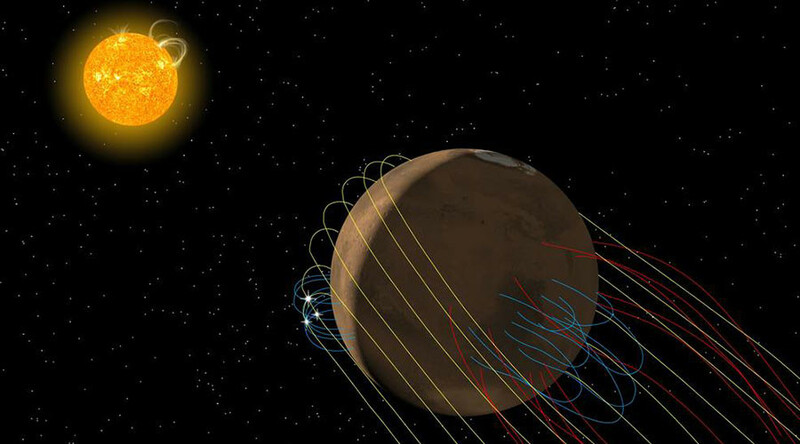 The “unique” magnetic field movement was measured and mapped using the MAVEN spacecraft’s magnetometer. Over the next couple of years, NASA plans to explore exactly how significant the impact of magnetic movement is to the Red Planet’s atmospheric loss.